Todd Elliott sees primitive skills not as mere survival skills but as "thrival" skills -ways of enhancing one's connection with the natural world. Todd has taught these skills to groups around the United States and abroad. These workshops are for wide variety of groups ranging from primitive skills gathering attendees to schoolchildren. Whether he is skinning bears or squirrels with stone tools or foraging edible wild plants, Todd finds that these traditional skills help to develop a deeper connection to the natural world. Todd is passionate about learning traditional crafts and skills from traditional people. Above is an image of Todd learning weaving patterns from a group of skilled native Patamona bushmen in the northern Amazon. Todd worked in the Congo Basin of Cameroon and learned many traditional life ways from Baka Pygmies and Bantu natives. 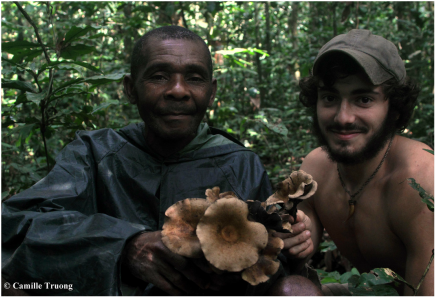 On the left Todd is pictured with a Baka chief and a harvest of edible African chanterelle mushrooms, Cantharellus congolensis. Below is a video showing Todd and Doug Elliott wildcrafting slippery elm bark. Todd feels that teaching and using traditional skills is by far the best way to preserve them. In the photograph on the left, Todd gives a bow drill friction fire demonstration to a group of elementary school students. Todd regularly uses the outdoors as a classroom. He has experience as a guide and is a Wilderness First Responder medic who has worked both on wilderness rescues and in emergency room settings.